Well happy New Year! A little late, I know, but ... better late than never, right? Anyhoo, I hope your 2013s are off to a fantastic start, and that you had wonderful holidays. I know that I've been absent from my little corner of the blog world these last few months, and while I'd love to say "I'm back!" I just can't say that yet. I hope to be - and soon! - but for now my sporadic visits are all I can commit to. I do sincerely appreciate those who continue to visit! That being said, I knew I had to post this recipe when a) John asked me to make it twice...in one week, and b) several people at work commented on it smelling so good as I reheated it for lunch! So, first things first, if you don't like cauliflower, you will probably still like this soup. John is not crazy about cauliflower, but says that it was so creamy and tasted nothing like cauliflower (though we couldn't figure out what it did taste like). The best part...there is no dairy in this (unless you add a little shredded cheese at the end...so worth it for my dairy-eating friends)! Roasting the cauliflower adds an incredible flavor and texture to this soup, and you will not believe how creamy it is, without one bit of cream or milk. Please just take my word - and the fact that I am writing a post after such a long absence just because this is so tasty! - and make this. It's super healthy, low calorie and absolutely delicious! *Preheat oven to 350 degrees. 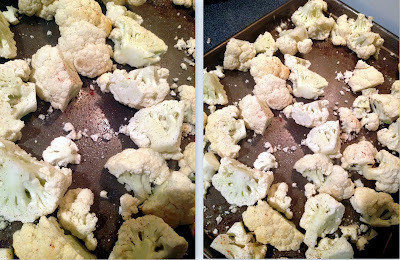 Chop cauliflower head into pieces (pictures below), being sure to remove the green stem and leaves. *Place pieces on a sheet pan and drizzle with 2 teaspoons olive oil, salt and pepper, garlic powder, smoked paprika and cheese sprinkle. Toss with a spatula. *Roast cauliflower for 30 minutes, tossing once or twice. *While cauliflower is roasting, chop onion and cook bacon (if including). 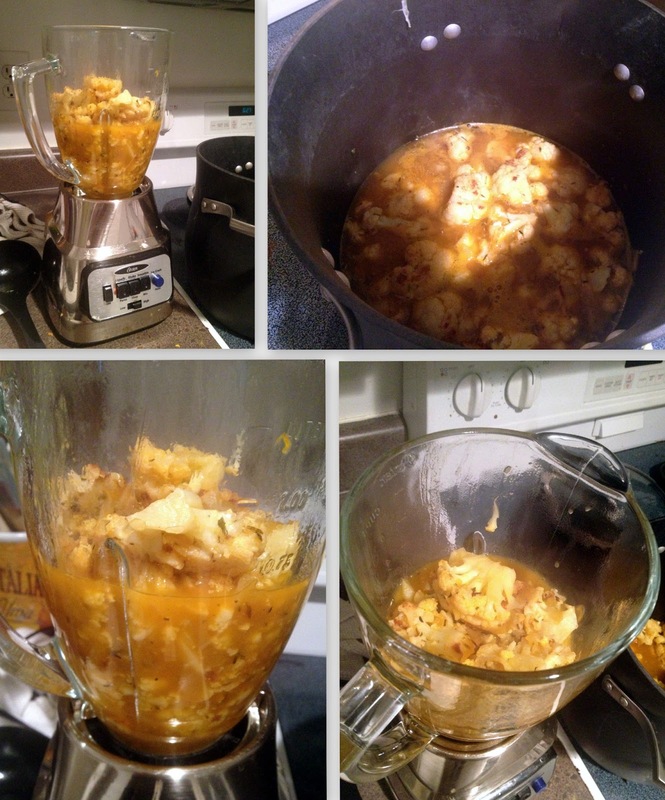 When cauliflower has about 10 minutes to go, place 2 teaspoons olive oil in a large soup pot and add chopped onions. *Cook for 5-7 minutes over medium heat, or until onions are translucent. Add minced garlic and cook for additional 1-2 minutes. 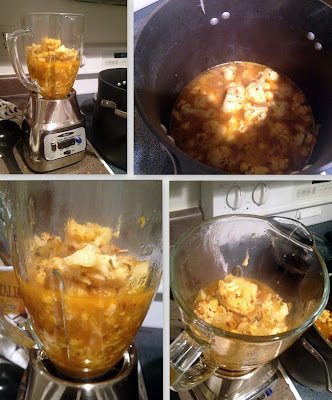 *Add roasted cauliflower to the soup pot, along with thyme, rosemary, salt, pepper and vegetable broth. Bring to a boil, then reduce heat and simmer, covered, for 25-30 minutes. 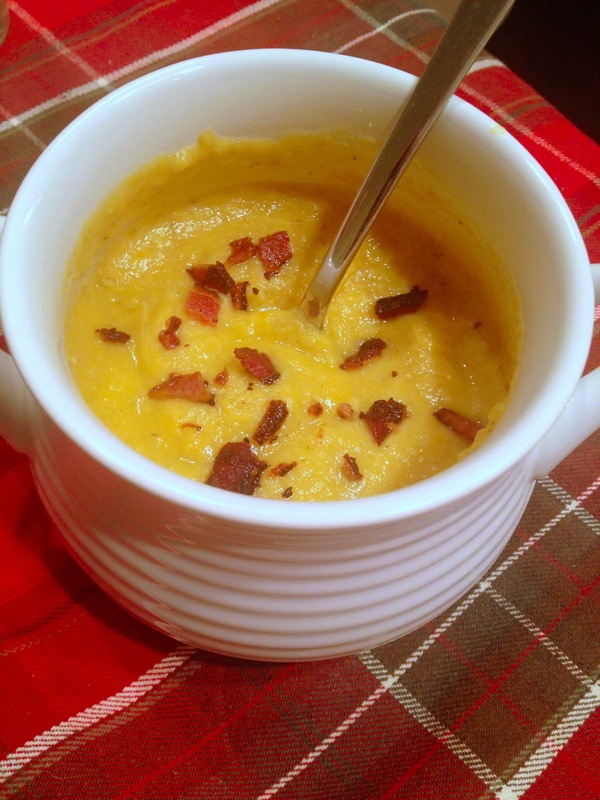 *Using a blender or food processor (and possibly in batches), combine soup ingredients until desired consistency - we liked ours smooth! Optional: add shredded cheddar cheese and stir until melted into soup. You may also use a splash of skim milk or vegetable broth if the soup is too thick for you. *Ladle into bowls and serve! Optional: sprinkle bacon crumbles on top, yum! steaming away, and in the blender ready to be pureed! 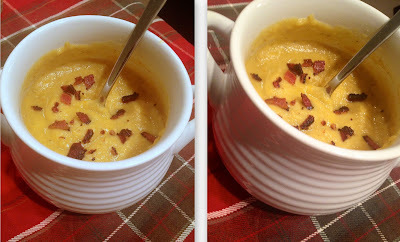 soup with cheese and bacon - yummy! plain - but not plain-tasting! - creamy soup!